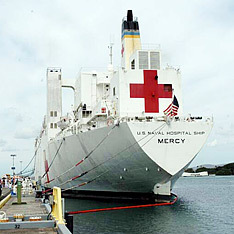 The Navy hospital ship USNS Mercy will stop at Pearl Harbor tomorrow after completing humanitarian missions in 10 locations in the Philippines, Bangladesh, Indonesia and East Timor. The Navy said that from May to September, Mercy's medical teams cared for more than 60,000 patients, performed more than 1,000 surgeries, repaired nearly 250 pieces of biomedical equipment, conducted more than 300 preventive medicine surveys and trained more than 6,000 people in various medical topics. Road and parking improvements at Kokee State Park on Kauai will start today, the state Department of Land and Natural Resources said in a release. Kokee Road improvements will be made from the Kokee State Park sign to the 15-mile marker, Moohihi Road, Puu O Kila lookout parking lot and entry road, and minor repairs at the Kalalau Lookout parking lot. During construction, one lane will be kept open to allowed continued access to the park. Contractor Niu Construction, Inc., will be doing the $590,000 project, which is expected to take seven months. Polihale State Park on the west coast of Kauai will be closed through tomorrow to allow Navy ordnance divers to disassemble what is believed to be a Vietnam-era 500-pound bomb located about a 800 yards offshore. Tom Clements, Navy spokesman, said the Navy doesn't know if the bomb is inert, "but in the interest of safety, we are treating it as live bomb." The Navy hopes to defuse the bomb sometime today. "Cancer Survivorship" will be discussed at a Leukemia & Lymphoma Society meeting from 5 to 6:30 p.m. tomorrow at the Weinberg Pavilion, fifth floor, St. Francis Medical Center, 2228 Liliha St. Speakers will be Patricia Nishimoto, adult oncology clinical nurse specialist at Tripler Army Medical Center, and Sheri Nishimura, University of Hawaii senior nursing student. They will present information to help patients become empowered by asking for their treatment summaries and treatment plan. The "Talk Story" group for leukemia, lymphoma, non-Hodgkin's lymphoma and myeloma (blood cancer) patients and families meets the third Wednesday of every month. Refreshments are served. Parking will be validated and paid for blood-cancer patients. For more information, call the society at (800) 215-1098, ext. 6645, or registered nurse Tusi Toomata-Mayer, 547-6889. Planetary scientist Ed Scott of the Hawaii Institute of Geophysics and Planetology will discuss "Rocky and Icy Minor Planets: Clues to the Origin of the Solar System" in a free public lecture at 7:30 p.m. Sept. 26 . The Hawaii Space Lecture Series is presenting the talk in Room 544, Pacific Ocean Science and Technology Building, 1680 East-West Road. For more information, call 956-3132. Kathryn Xian of Honolulu, an accomplished filmmaker, has received the Soroptimist's 2006 Making a Difference for Women Award. Soroptimist is an international volunteer organization of business and professional women who work to improve the lives of women and girls. Xian received $5,000, which she donated to The Safe Zone Foundation, a nonprofit organization she founded to prevent violence against women and girls through education and art. Xian also received $500 from the Waikiki club and $400 from the Soroptimist's Founder Region. She is a director of Girl Fest Hawaii, an arts and culture festival that raises awareness about women's issues. Manawale'a Riding Center has given the national President's Volunteer Service Award to Kealaka'i Leandro, winner of the gold award, representing 100 or more hours of service. Malia Bowman and Lia Kamana received silver awards, representing 75 to 99 hours; and Rae Shrecengost and Genevieve Friel, the bronze award, for 100 to 250 hours. They all learned to groom and saddle horses used in the center's disabilities program, to use adaptive equipment, and to assist in walking horses and providing support for riders. 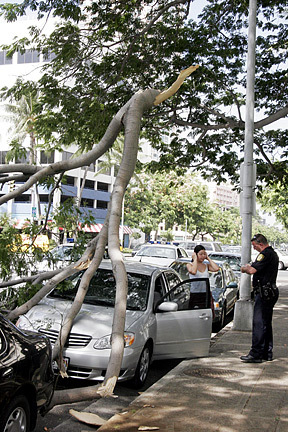 Stacy Adachi found when called to her parked car yesterday that a large limb from a tree had fallen and damaged her vehicle at King Street and Ward Avenue. No injuries were reported. Big Island police identified the 25-year-old Pepeekeo man who died Saturday from injuries received in a single-car crash as Aaron Alvarez. Alvarez was a back-seat passenger in a car traveling south on the Hawaii Belt Road when it crashed one-tenth of a mile north of the 8-mile marker in Papaikou. Police determined the driver of the 1993 Nissan four-door sedan, another 25-year-old man from Pepeekeo, lost control of the car. The sedan ran off the road into an embankment and overturned, police said. The driver and the front-seat passenger, a 20-year-old Hilo man, were taken to Hilo Medical Center by fire rescue personnel. The driver was treated and released, police said, but the passenger's condition was not known. Police arrested the driver for negligent homicide, operating the vehicle under the influence of an intoxicant, and driving without a license and no-fault insurance. He was released pending further investigation. Traffic enforcement officers have ordered an autopsy to determine the cause of death. This is the 27th Big Island traffic death this year compared with 28 the same time last year. Anyone with information concerning the accident is asked to call officer Robert Pauole at 961-8119. Fire destroyed a house in Honokaa on the Big Island Sunday night. Fire crews were called to the house at 10:01 p.m. and found a small single-family home fully engulfed in flames, according to a Big Island Fire Department news release. It's unclear whether anyone was living in the house. Fire officials said the home collapsed and was declared a total loss. Police arrested a 53-year-old man who allegedly tried to use a fake bus pass Sunday. Police said the man boarded a city bus at about 5:30 p.m. along Kapiolani Boulevard. The bus driver noticed that the bus pass the man used was fake and called police. The man was arrested for investigation of first-degree forgery.